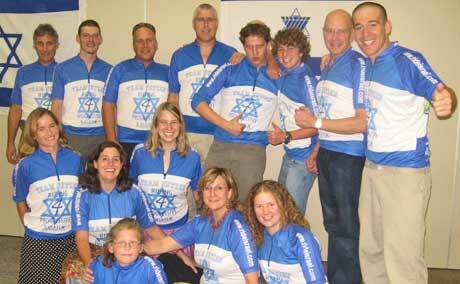 WHAT started as a dream four months ago when I arrived in Cape Town, became a reality last Sunday (11 March 2007), when 20 Progressive Jews wore the same cycling top and went riding together on the 2007 Argus cycle challenge. 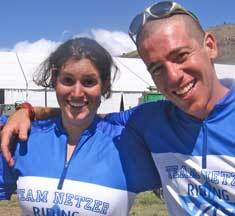 All of them finished.It all started as an idea of Vered Margalit, the shlicha in Gauteng, and myself, the Cape Town shaliach, to ride, just the two of us, in the biggest cycling race in the world.We then realized there was potential to bring more people together through the love of the sport. Vered and I, together with Navot Naor, our Durban shaliach, went out to our fellow congregants looking for cyclists and donors to make the event a fundraiser for our Netzer youth. I turned to a designer and together we created a shirt that represents some of our youth movement’s main ideas: Zionism (blue & white shirt with a Magen David), Progressive Judaism (Temple Israel’s logo) and a strong connection to the greater Jewish community (the Jewish agency and MASA logos). The response was very good. And so, on the last Friday before the race, we got together in Temple Israel, Green Point, in Cape Town for a special service and a carbo-loading Shabbat dinner (See group picture of us below). Progressive cyclists from all around the country (Cape Town, Pretoria and Johannesburg) gathered for this special event. The Shabbat service, beautifully planned and performed by the young leaders of Netzer, was as always, full of songs and happiness, welcoming the Shabbat in our special way. Our much respected Rabbi Greg Alexander helped lead the service with great spirit and advice. He also gave the cyclists a welcoming blessing and Birkat Haderech (a cyclist before a race can never get too many good lucky wishes). After the service, we all met in the big hall for a lovely dinner made for us by Liza and Tzuriel. The cyclists were presented with their specially designed tops and spirits were high. What a great thing it is to combine the love of sports, the feeling of togetherness and the Mitzvah of helping our youth! Without doubt, the peak of the weekend was the Argus Cycle Challenge itself. Almost 40,000 participants, men and women, from young to old, all riding together around the most beautiful city in the world. Each and every one of the Progressive team successfully completed the race, with a huge smile on his or her face and a big sense of accomplishment. Once again, together we’ve proved that we are happy and proud to be Progressive Jews in South Africa! Thanks to all cyclists and to everyone who helped us make this dream come true!